We’d love your help. Let us know what’s wrong with this preview of Thornwood House by Anna Romer. When you're all that stands between the murderous past and the fate of those you love, how far would you go to save them? When Audrey Kepler inherits an abandoned homestead in rural Queensland, she jumps at the chance to escape her loveless existence in the city and make a fresh start. In a dusty back room of the old house, she discovers the crumbling photo of a handsome Wo When you're all that stands between the murderous past and the fate of those you love, how far would you go to save them? To ask other readers questions about Thornwood House, please sign up. Why is this book unavailable in written form in the U.S.? It is available only in audible form. One of the main characters happens to be deaf and he is portrayed in quite a realistic and positive way. There are not many books with deaf characters. Having this book not available in written form makes it not accessible to the deaf community. Jess This would be a publisher's choice - much in the same way that any non-blockbuster US novels take many months to make it to Australia, it's either in…moreThis would be a publisher's choice - much in the same way that any non-blockbuster US novels take many months to make it to Australia, it's either in production or not available due to export costs. The audiobook would have been manufactured for the Australian audience, which is why it would be available - no cost to download! Kate DiGiuseppe No it isn't the story of a boy hunting and finding a mother and child. Audrey Kepler inherits an abandoned homestead in rural Queensland. The timing couldn't have come at a better time as Audrey needed to get out and start a new life which she now intended to do. So with her eleven year old daughter Bronwyn by her side Audrey sets off for Queensland. Once they are settled in the house, Audrey stumbles across an old photo of the former owner Samuel Riordan. In time Audrey starts to get preoccupied with finding out more about Samuel. Only it seems the deeper Audrey d Audrey Kepler inherits an abandoned homestead in rural Queensland. The timing couldn't have come at a better time as Audrey needed to get out and start a new life which she now intended to do. So with her eleven year old daughter Bronwyn by her side Audrey sets off for Queensland. Once they are settled in the house, Audrey stumbles across an old photo of the former owner Samuel Riordan. In time Audrey starts to get preoccupied with finding out more about Samuel. Only it seems the deeper Audrey digs into the past of Samuel she discovers some disturbing information. Mixed thoughts about this one. It was a pleasant read and there was a good story buried within it but there was a lot of extra stuff there that could have been left out. I enjoyed the present day parts except when Audrey was hallucinating all over the place about Ayesha and Sam. Apparently she had a weird psychic connection with the house. Of course it was a technique used by the author to allow us to see the past but I thought the diary was a much better way and found those sections very readab Mixed thoughts about this one. It was a pleasant read and there was a good story buried within it but there was a lot of extra stuff there that could have been left out. I enjoyed the present day parts except when Audrey was hallucinating all over the place about Ayesha and Sam. Apparently she had a weird psychic connection with the house. Of course it was a technique used by the author to allow us to see the past but I thought the diary was a much better way and found those sections very readable. The other big problem for me was too many dead people. For one family they attracted an unfair number of murders and suicides. If I had been Audrey I think I would have taken Bronwyn a long, long way away! One more complaint - the ending was silly. Nevertheless three stars because I enjoyed the story, liked the setting very much and enjoyed the characters and dialogue. But it wasn’t long before the past was beckoning Audrey – the mysterious deaths of two young women connected to Tony’s past; the photo of Samuel Riordan and the horrific accusations surrounding him. Audrey felt she needed to know the truth – but could she unravel something from so long ago when the police hadn’t been able to? The secrets which encompassed the people of the district – the feeling of danger that Audrey could sense; was that long ago past suddenly encroaching on Audrey and Bronwyn’s new life in Thornwood House? Should they leave the area before it was too late? 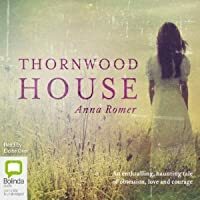 Thornwood House by Aussie author Anna Romer was a wonderful debut novel. Gripping and intense, especially in the second half of the book, it kept me enthralled until the end. Filled with tension and brilliantly written characters, it felt so real! I thoroughly enjoyed Thornwood House and highly recommend it. I love anything written in Australia, especially if it’s set somewhere I know or have been. And any book that goes back in time via old letters and diaries is high on my list to read. Each chapter of Thornwood House transported me to another time, and was jam packed with surprises, skeletons in family closets, and a cast of both lovable and wicked characters. There's a little bit of everything in this novel. Love, mystery, murder, war and history. I got teary in places, and laughed in others. And I love a novel which is fiction but includes real facts so I get to learn things I didn't know before. Delving into the personal lives of people through their diaries and letters always makes me sad, especially when the person is no longer here and stories and secrets unfold that they were never to know. Thornwood House completely hooked me in, with the chapters alternating between past and present. The historical sections were extremely well researched, and gave this novel a real life feel. It's an awesome mix to fold up in one novel and the best thing is, it's all set in Australia. I can see why it's been called a gothic thriller. The author’s vivid descriptions of the Australian landscape, and of the dangers and creepiness of the Australian bush (especially at night!) are chilling. The author deeply explores her characters, who are not your usual run of the mill, a real mix which made the story all the more interesting. You get the feeling something’s brewing, but you're never really sure what it is, or who you can trust! I love this author. I love her writing style. You can tell she’s passionate about Australian flora and fauna. Her descriptions make you feel you are actually there with everything going on around you. I could easily visualise the old house and felt as though I knew it, and now I want antique furniture! Thornwood House keeps you on the edge of your seat all the way through. It's a book that lingers with you long after you've finished, a book you can't stop reading but don't want to end. I can't wait for Anna's next novel, this one goes on my list of best books ever! Put it on your reading list, you won't regret it. It's one I'll be recommending for years to come! I know there are great things ahead for this author! I started this book with great anticipation. The story concerns Audrey Kepler, who thanks to her former lover and father of her 11 year old daughter Bronwyn, inherits an abandoned house and land in rural Queensland. In that house she discovers a photograph of Samuel Riordan, a former owner. She becomes obsessed with him and finds herself unable to believe the stories told about him. In the process of trying to find out more about Samuel she discovers the tragic story which includes a couple of d I started this book with great anticipation. The story concerns Audrey Kepler, who thanks to her former lover and father of her 11 year old daughter Bronwyn, inherits an abandoned house and land in rural Queensland. In that house she discovers a photograph of Samuel Riordan, a former owner. She becomes obsessed with him and finds herself unable to believe the stories told about him. In the process of trying to find out more about Samuel she discovers the tragic story which includes a couple of deaths in the family. The descriptions of the house and Australian bush were well portrayed. But at times I got fed up with passages of description that seemed to have no relevance to the story e.g. the description of the carnivorous plants in the glass house. I thought it could have done with a serious edit. I found myself skipping bits. I also objected to hearing about emerald eyes. I don’t know about you but I have never seen anyone with eyes the colour of emeralds. Green yes, but not that strong vibrant green of emeralds. Added to this, I found Audrey’s obsession with Samuel and the Aylish story started to annoy me. Towards the end as events spiralled, I found it harder and harder to suspend disbelief, so while the story was interesting in some ways, it didn’t live up to my expectations. However, having said that this is Anna Romer’s first novel and I will still be interested to read Lyrebird Hill which is on my to read list. I’m participating in a reading challenge with a sweet and lovely fellow bookworm and our July reading challenge was a book that a friend has recommended and Thornwood House was her choice for me and I am so grateful as I’m sure it would have been a long time before it appeared on my TBR pile. At the start of this year I gave Anna Romer a glowing review of her third book Beyond the Orchard, I never imagined that I would love her debut novel Thornwood House more. This book blew me away, I’m still I’m participating in a reading challenge with a sweet and lovely fellow bookworm and our July reading challenge was a book that a friend has recommended and Thornwood House was her choice for me and I am so grateful as I’m sure it would have been a long time before it appeared on my TBR pile. At the start of this year I gave Anna Romer a glowing review of her third book Beyond the Orchard, I never imagined that I would love her debut novel Thornwood House more. This book blew me away, I’m still trying to make sense of my thoughts and feelings towards this exquisite piece of literature. I was spellbound and mesmerised by the most beautiful flowing descriptive language I’ve ever read - every passage took my breath away. Our five senses well and truly come alive during the reading of this magnificent book. You can almost feel yourself stepping into the characters shoes and walking in their footsteps. My all time favourite book is Black Diamonds by Kim Kelly and now I have found my second favourite book of all time THORNWOOD HOUSE! Audrey Kepler and her 11 year old daughter, Bronwyn inherit an abandoned homestead "Thornwood House" in rural Queensland. Determined to make a new start for themselves, they pack up and move into the house. While settling in, Audrey becomes drawn to the dusty back room of the old house and discovers an old photo of the former owner Samuel Riordan. Intrigued and fuelled by the lack of her former partner's forthcomings about his family and past, Audrey soon finds herself obesse Forgive me, darling? Audrey Kepler and her 11 year old daughter, Bronwyn inherit an abandoned homestead "Thornwood House" in rural Queensland. Determined to make a new start for themselves, they pack up and move into the house. While settling in, Audrey becomes drawn to the dusty back room of the old house and discovers an old photo of the former owner Samuel Riordan. Intrigued and fuelled by the lack of her former partner's forthcomings about his family and past, Audrey soon finds herself obessed with Samuel's story. As Audrey digs deeper into Samuel's story, she discovers he was accused of bashing to death a young woman on his return from the war in 1946. As one thread appears to end, Audrey finds more unraveling and with her doing all this digging around, the stirring she has created, has now drawn the eye on her from someone who is very determined to keep the past where it lies. 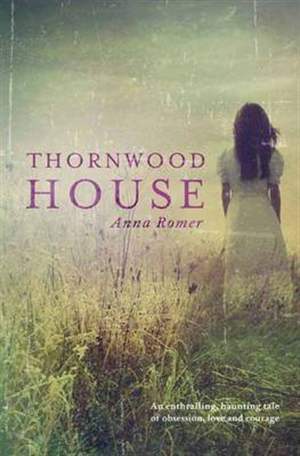 I loved Thornwood House, it was the debut novel for Anna Romer. There is so much to love about this story. I loved the descriptions of the bush and rural Queensland in small country town like Magpie Creek. The characters are all different from one another. The moment you read the first page to the last there is incredible subtle tension of suspense within your heart (well it was there for me), that just wanted you to hurry up and get back to the story for the what's next. Some aspects of the story that I loved is the character of Danny, he is so robust and just a delight to have come alive in my imagination. I enjoyed the fact that Romer didn't over power or force a huge romance in the book but rather let it blossom slowly. I loved dipping into the past through letters and diary entries - it was very well portrayed in the story. I did over the course of the novel find myself skimming the heavily descriptions of the bush or an object at times, eager to get on with the story, I think this is ultimately what stopped me from giving it a full 5 stars. Overall I was engaged from the start to the finish, I even found myself becoming detective to try and solve the mystery before Audrey. Thornwood House provided my mind and my heart with suspense, adventure, mystery, romance, love. Empecé como si nada, pero me enganchó enseguida y sólo quería leer y leer para ver el desenlace final. Prácticamente en dos días lo he devorado. Historia con mucha intriga y secretos familiares contados en dos tiempos (pasado y presente). Ambas historias te mantienen en suspenso hasta que llegas al final… un final que me ha gustado muchísimo y el epílogo todavía más. Súper recomendado para quién le guste el suspenso. También tiene su toque romántico. I must confess that if I had not won this in a book pack I would never have read it, which would have been a shame because I ended up loving this book. Crime is not my thing, so despite the pretty cover, as soon as I saw that it contained a murder mystery I would have dismissed it. Again, thankfully I didn’t it. Thornwood House was a gripping tale. I was pulled right in from the beginning and could hardly put it down. Audrey inherits a beautiful old homestead in rural Queensland named Thornwood. I must confess that if I had not won this in a book pack I would never have read it, which would have been a shame because I ended up loving this book. Crime is not my thing, so despite the pretty cover, as soon as I saw that it contained a murder mystery I would have dismissed it. Again, thankfully I didn’t it. Thornwood House was a gripping tale. I was pulled right in from the beginning and could hardly put it down. Audrey inherits a beautiful old homestead in rural Queensland named Thornwood. She and her daughter go and view the property wanting to sell it, but Thornwood quickly sinks under her skin. She and her daughter move in, and as Audrey is exploring the house, she discovers a picture of a handsome young war medic – Samuel Riordan. She discovers he was accused of bashing to death his love. Audrey finds a letter from that love and is convinced Samuel couldn’t be the one who killed her. Unable to let it go, she digs deeper into the mystery, and soon, more and more secrets about this family unravel. There were so many things about this book that made me fall in love with it, despite it bring a mystery. First, it was really well written. The characters were alive and full of personality. Audrey was a strong, highly likeable character. She was a survivor, an adapter. She just leapt off the page. Second, it was set in the country, and I love country settings. Thornwood was a dream property, with an abundance of land, the kind of property I would love to live on one day. I pictured it so vividly that I was walking in and out of the dusty rooms and exploring the surrounding sprawling land with Audrey. Third, we get glimpses into Aylish’s past – the girl who was murdered – and this is very much her story as well as Audrey’s. I also loved reading the old letters and dairy entries along with Audrey. Fourth, there was romance. It was very much a sub-plot, and nowhere near as dominant as the mystery, but it was there. I loved that it was because I love romance. What I loved, and what I must commend Romer on, is having the love interest deaf. Plus one for diversity. An Australian gothic novel, Thornwood House is a haunting story of mystery and murder spanning four generations. When Audrey Kepler inherits a neglected homestead in rural Queensland she decides to make it a home for herself and her eleven year old daughter. The childhood home of her daughter's late father, Anna is surprised to discover Thornwood House harbours a tragic history. In 1946, Tony's grandmother, Aylish was murdered in the grounds, a crime his grandfather, Samuel, was accused of committing. Two generations later, Tony's teenage sister Glenda died in the same clearing, though her death was ruled accidental. Plagued by vivid dreams, Audrey develops an obsession with the deaths and as she digs into the past uncovers secrets that may threaten any future happiness. What particularly impressed me about Thornwood House was Romer's vivid descriptions of the Australian landscape, the contradictions of the bush, its dangers and its beauty, nurtures the haunting atmosphere of the story. I could easily visualise Thornwood House, and the other locations important to the story. Overall, I thought the writing to be expressive and evocative. I think the mystery of Aylish and Glenda's deaths were well plotted, the author offers deft misdirection and clever twists, at least one I didn't see coming at all. Though Audrey is the primary narrator, Aylish and Glenda find a voice through letters, diary entries and dream visions. Sadly I have to admit that I grew somewhat impatient with Audrey, I have never been a great fan of the gothic heroine despite finding the other elements of the genre appealing. For me, Audrey's obsessive nature was tiring after a while, seven years seems far too long to be pining after a man who treated her as Tony did and I found the way her obsession transferred to Samuel creepy, but not in a good way. This just couldn't catch my interest, but I'm not sure why. Perhaps because I was so annoyed by the initial first person present tense style in the prologue. I thought I could get past it, but for the entirety of the 20 minutes I gave this audio, my mind kept wandering and I found myself both unmoved and uninterested in the story. Audiobook via Audible. DNF after 20 minutes. I thought this was a great debut novel and look forward to reading more of Anna Romer's work. It had a bit of the thriller about it, with a 2-generations-old mystery surrounding old Thornwood House. I was listening to this one as an audiobook and I got to the point of the final 3 hours (of 16.5) one evening, and I had to decide whether to keep going for another hour or 90 minutes and then stop, continue to the end (and get to bed later than usual), or stop right then and continue at another time I thought this was a great debut novel and look forward to reading more of Anna Romer's work. It had a bit of the thriller about it, with a 2-generations-old mystery surrounding old Thornwood House. I was listening to this one as an audiobook and I got to the point of the final 3 hours (of 16.5) one evening, and I had to decide whether to keep going for another hour or 90 minutes and then stop, continue to the end (and get to bed later than usual), or stop right then and continue at another time. I kept going for a little bit longer and then couldn't stop at all!! I did work out the answer to the mystery about half-way through the book, although I couldn't explain the whys or wherefores of it. This book is really good - really good! The writing is so good that I am wishing I had not listened to it as an audio; its the kind of book (I have since borrowed from the library) that you want to slowly absorb, letting the prose sink into your very being, go back and read again. Which I may well do. If you are Australian your will love the local lingo. Brilliant! Captivating! Great new Aussie writer. I really enjoyed this one! Set in Queensland so close to me!!!! ... I loved reading about the country, the towns, the setting - it was all so familiar and not something I get very often!! I loved the story, the mystery and the twists along the way. A great read from an Aussie author! This book is set in Australia on a quiet piece of property where secrets are deep and dark. I liked the mystery of this. It had a genealogy vibe as Audrey tried to unravel some family mysteries. I liked her but her mothering skills had me wondering if she was really a mother. I liked some of the descriptive strokes. The author was creative. Sometimes I thought, "Wow," and other times I was doing page math because it felt long. The author was especially wordy in her descriptions of place. Sometim This book is set in Australia on a quiet piece of property where secrets are deep and dark. I liked the mystery of this. It had a genealogy vibe as Audrey tried to unravel some family mysteries. I liked her but her mothering skills had me wondering if she was really a mother. Just before Christmas I brought a stack of books to read over the holidays. Some were on kindle, some were paperbacks. I read Anna Romer's Lyrebird Hill while on holiday, but didn't have a chance to review it properly, although I did rate it 4★. So when I returned from holidays and sorted through the paperbacks I bought, I knew I had to read Thornwood House next. Audrey is a great character. She's insecure but also strong-willed, and wants to do the best she can for her daughter, Bronwyn. At the Just before Christmas I brought a stack of books to read over the holidays. Some were on kindle, some were paperbacks. I read Anna Romer's Lyrebird Hill while on holiday, but didn't have a chance to review it properly, although I did rate it 4★. So when I returned from holidays and sorted through the paperbacks I bought, I knew I had to read Thornwood House next. Audrey is a great character. She's insecure but also strong-willed, and wants to do the best she can for her daughter, Bronwyn. At the same time, she's curious, wanting to know more about Tony, Bronwyn's father - the man she thought she knew completely, but really didn't. The supporting cast is introduced slowly and we get to know the characters as Audrey does. I liked that Audrey didn't know who to trust at first, made snap judgements, but also tried to keep an open mind. I like that the romantic thread of the story in the present developed slowly and didn't feel forced. Extra brownie points because the love interest has a disability, but doesn't feel the need to be any different. Plotwise, this is a really well-written book. There was the first mystery about why Audrey's former partner killed himself, and then the secrets kept coming. The heightened tension as Audrey came closer to uncovering the truth meant I could barely put the book down. Throughout the book, there were a few misdirections to keep you on your toes. The supernatural element added was intriguing, although I did wonder where it would go in the end. I'm pleased to say it was handled rather well. I first heard of this book when it was being spoken about locally as it was set in my local area and the author has strong ties here. This was enough for me to obtain a copy and give it a go. I'm glad I did. I expected a nice read and I was looking forward to seeing local icons in the book. But what I wasn't prepared for was the depth, the mystery and suspense throughout the book. It is a whodunit with murders spanning four generations. There are heaps of twists as the book unfolds but there are I first heard of this book when it was being spoken about locally as it was set in my local area and the author has strong ties here. This was enough for me to obtain a copy and give it a go. I'm glad I did. I expected a nice read and I was looking forward to seeing local icons in the book. But what I wasn't prepared for was the depth, the mystery and suspense throughout the book. It is a whodunit with murders spanning four generations. There are heaps of twists as the book unfolds but there are subtle clues all the way along. I ended up working out whodunit or rather the feelings I'd developed proved to be correct as the answers were revealed in the last chapters. The scenes in the novel were wonderfully described and I felt I was there as the drama unfolded. I could see the house, I could see the tree with its hidey holes and I could see the gully where all the action happened. I will be seeking out future novels by Anna. She has a gift. He pasado unas horas muy entretenidas con esta novela. La mezcolanza de historias del pasado, dolores y pérdidas presentes, y misterios terroríficos me ha parecido una gozada. Además, la autora me ha enseñado una nueva visión prácticamente desconocida para mí: la situación de Australia durante la II Guerra Mundial. Y la localización de la historia me ha fascinado: la parte menos 'conocida' de Australia, exuberante, frondosa, verde. Y todo esto viene presentado con una traducción de gran nivel (un aplauso para la editorial por mi parte). This book is absolutely brilliant! It's not just my favourite for this year but it's the best book I've read in a few years now. This isn't even a genre I particularly like but I couldn't read this fast enough. It not only has a break neck speed but the suspense keeps you on edge throughout the entire book. The writing is superb with a beautiful flow to it. Anna Romer is up there with Jodie Picoult and Diane Chamberlain and if you like these authors then add her to your must read list. Gefallen hat mir auch der faszinierende und exotische Handlungsort. In vielen Abschnitten spürt man die tiefe Liebe der Autorin zur australischen Landschaft und zur Flora und Fauna des 5. Kontinents. Man riecht förmlich den Duft der Eukalyptusbäume oder des wilden Jasmins, sieht die Glockenvögel und Loris vor dem inneren Auge vorbeifliegen. Die kleinen Zeichnungen der Autorin am Anfang des Buches von Thornwood House und Umgebung fand ich ebenfalls sehr nett gemacht und hilfreich. Der Klappentext hat mit eine packende Geschichte über alte Erinnerungen, Obsessionen, Verdächtigungen und eine große Liebe absolut ins Schwarze getroffen. Das Rosenholzzimmer ist eine großartige, verzweigte und düstere Familiengeschichte, die ihre Finger über ein halbes Jahrhundert bis in die heutige Zeit ausstreckt. Nur leider konnte sie mich nicht von der ersten bis zur letzten Seite fesseln. Ich hatte am Anfang meine Schwierigkeiten mit dem Schreibstil & immer wieder war ich aus der Geschichte raus, was sich dann aber innerhalb der Seiten gab. I just love discovering fresh Australian talent, a new author that will have me counting down the days until their next book release. Anna Romer is on that list! When I sat down to write this review, I had so many thoughts and feelings buzzing around that I worried I wouldn’t be able to get across how much I loved this book. Then I read back over the S&S media release for Thornwood House and sighed with relief. They’ve already come up with a perfectly succinct summary of the book. “A beautiful I just love discovering fresh Australian talent, a new author that will have me counting down the days until their next book release. Anna Romer is on that list! That’s exactly what this story is and the fun part is picking up the book and discovering exactly that- plus all the things about the story that can’t be captured in one sentence. Rather than give a recount of the synopsis, I’m just going to share my feelings about the book. There’s so many story threads that weave together that it would be impossible for me to give it justice and I think it’s far more enjoyable discovering that for the first time when reading this story. By about a third of the way into the book, I was completely hooked. I felt the eeriness of the house that Audrey and her daughter Bronwyn inherit in rural Queensland and my curiosity was piked. There’s something about Romer’s writing style that really drew me in, the way she created characters that felt so real and how skilfully she did all that with a novel written in first POV, all told from Audrey’s perspective (and interspersed with dreams and letters). I felt the obsession and the anticipation as Audrey devoured the letters and diaries, I was turning the pages of the book just as quickly. The romance sub-plot was also beautifully done. Who would’ve thought a deaf hero could come so alive on the page and the attraction between Audrey and Danny was sizzling just like the Aussie sun. The mood and tension so cleverly developed to make this romance very believable and realistic. The suspense in Thornwood House has to be one of its main strengths. I honestly didn’t feel like I could trust anyone in the town (a projection of Audrey’s own suspicious nature) and I was eager to find out who the villain was. By the last 100 pages, I sat up reading late into the night, turning the pages so quickly with my heart literally pounding in my chest. I felt like I was Audrey and that my life was in danger. So much so, that by the time I finished the book and turned off the bedside lamp it took me hours to fall asleep because I felt so hypervigilant! Thornwood House is jam packed with tension, intrigue, suspense, romance, Aboriginal folklore, the quaintness (and peculiarities) of a small town and hidden truths. I can’t recommend this book enough! I'm pretty sure this book came out of nowhere just to floor me. Never have I been so glad that I find it impossible to put down a book! The first 150pages-ish were just really average, I wasn't interested, nothing grabbed me and it just felt a little too unbelievable that this woman was having visions of the past. But then the truth started to unfold and I realised that for the first time my feeble attempts to convince myself not to put a book down because 'it might get better' we're actually co I'm pretty sure this book came out of nowhere just to floor me. Never have I been so glad that I find it impossible to put down a book! The first 150pages-ish were just really average, I wasn't interested, nothing grabbed me and it just felt a little too unbelievable that this woman was having visions of the past. But then the truth started to unfold and I realised that for the first time my feeble attempts to convince myself not to put a book down because 'it might get better' we're actually coming true. Once I hit this point I simply smashed through the rest, and this was a bit of a hard slog of a read. It's not light, it's not easy and it's not quick. I ended up finishing this book much too late last night and much too creeped out to be about to go to sleep. The entire way through the book I was much more interested in the flashback chapters than the 2006 chapters. I just found Audrey a bit annoying and a bit nothing, but then again there was always spunky deaf Danny near to hand ( a note here though: Danny what a weird time and place to try for the first kiss). I also struggled with trying to remember four generations of family most of who (whom?) died in mysterious circumstances, but maybe that's just me, I find it near impossible to follow too many characters. This review has been hidden because it contains spoilers. To view it, click here. This was like reading an episode of Home and Away! It has potential and the setting in Queensland is lovely, but the writing was riddled with clichés and the plot was straight out of a bad movie. I mean…the ‘dead’ guy’s eyes opened and it turns out 20 years later that he never actually died. Please! Anna Romer is an Australian writer. Her novels reflect her fascination with forgotten diaries and letters, dark family secrets, rambling old houses, and love in its many guises—as well as her passion for the uniquely beautiful Australian landscape.